Do your kids show an interest in music? Would you like to see how they would both enjoy and benefit from music lessons? Would you like a friendly and professional teacher to take you to the next level? Would you like to have fun performing in a band or ensemble? Our focus is on teaching music. Our professional and university trained teachers can offer you or your child a musical education second to none. They are friendly, patient, and know how to make learning fun. Remember, the right teacher can make all of the difference. Our office staff will help you choose just the right teacher, and on a day and time that is convenient for your schedule. We teach most musical instruments, including piano, guitar, voice, drums, strings, brass and woodwinds. (See below for a complete list) No matter what type of music you are interested in, you won’t find a more enjoyable and inspiring place to learn. Pick your style - classical, popular, rock, jazz, blues, hip-hop, folk, country, acoustic, electric - it’s all right here. 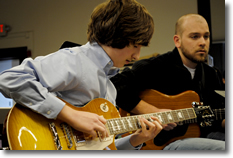 Music lessons for all ages – beginner to advanced. Children and adults get one-to-one, patient attention. Private, individual instruction for most instruments and voice. Plus, group lessons are available for guitar. Voice / Singing instruction from top voice teachers. Popular, Broadway, Classical, Opera, Jazz…we teach it all! We’ve helped numerous school Band and Orchestra students improve their playing. We teach all musical styles including popular, classical, rock, jazz, blues and many others. Lesson studios feature high quality pianos and recording equipment. Parents can witness their children’s progress in recitals several times each year. These provide students with performance experience and build confidence. Adult students are also encouraged to participate. Easy and affordable instrument rentals featuring top brands and many great value program features. Opportunities for technology assisted learning including digital recording of lessons. Office staff available 10am to 7pm Monday – Friday, and Saturday 9am to 1pm to assist with your scheduling other questions.